The Authorized Version (AV), commonly known as the King James Version (KJV) or King James Bible (KJB), is an English translation of the Christian Bible by the Church of England begun in 1604 and completed in 1611. 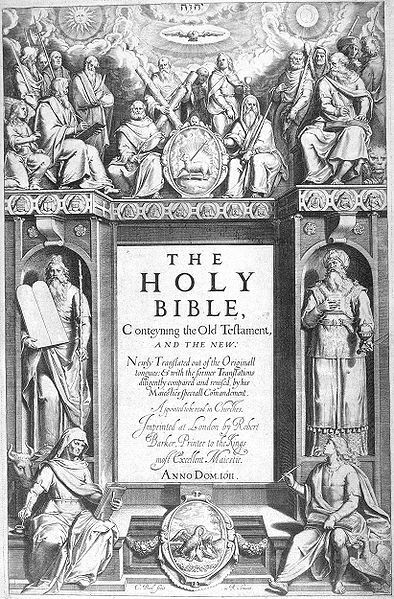 First printed by the King's Printer Robert Barker, this was the third translation into English to be approved by the English Church authorities. The first was the Great Bible commissioned in the reign of King Henry VIII, and the second was the Bishops' Bible of 1568. In January 1604, King James VI of Scotland and I of England convened the Hampton Court Conference where a new English version was conceived in response to the perceived problems of the earlier translations as detected by the Puritans, a faction within the Church of England.James gave the translators instructions intended to guarantee that the new version would conform to the ecclesiology and reflect the episcopal structure of the Church of England and its belief in an ordained clergy. The translation was done by 47 scholars, all of whom were members of the Church of England. In common with most other translations of the period, the New Testament was translated from Greek, the Old Testament was translated from Hebrew text, while the Apocrypha were translated from the Greek and Latin. In the Book of Common Prayer (1662), the text of the Authorized Version replaced the text of the Great Bible – for Epistle and Gospel readings – and as such was authorized by Act of Parliament. By the first half of the 18th century, the Authorized Version was effectively unchallenged as the English translation used in Anglican and Protestant churches. Over the course of the 18th century, the Authorized Version supplanted the Latin Vulgate as the standard version of scripture for English speaking scholars. Today, the most used edition of the King James Bible, and often identified as plainly the King James Bible or King James Version, especially in the United States, remains the standard text of 1769, edited by Benjamin Blayney and Francis Sawyer Parris at Oxford.